Students across the United States graduate with, on average, $30,000 of student loan debt, which can take years — sometimes decades — to pay off. How this affects the Latino community, specifically, is an under-reported story. 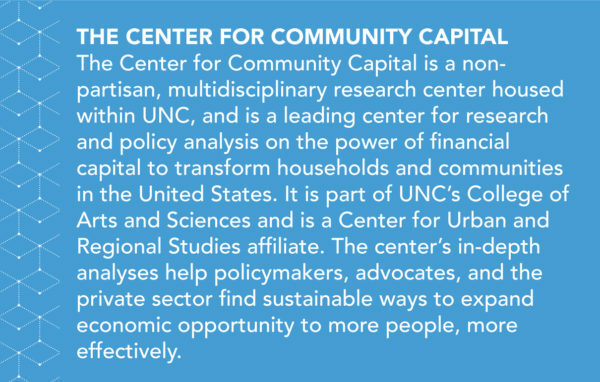 But the UNC Center for Community Capital has partnered with UndiosUS in an effort to change that. 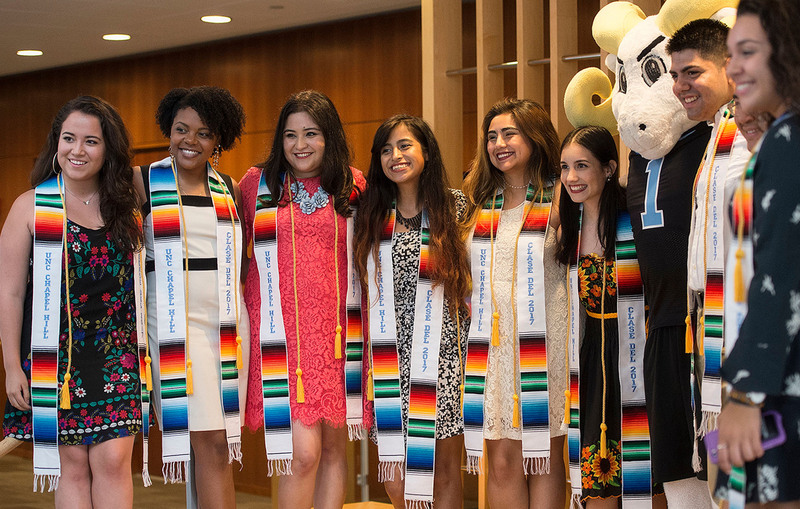 Graduating seniors celebrate their Latin heritage at a special commencement ceremony hosted by the Carolina Latinx Collaborative, which provides a supportive environment for students, faculty, staff and alumni to discuss and understand important issues that affect the Latino community. On a cold February day in 2017, near the lower west side of Chicago, Ana sits in a tight conference room at the community-based organization where she’s worked for the past few years — a job she has in part because of her college degree. She describes the moment when she started thinking about pursuing college. Ana is in her mid-20s, a Latina, and the first in her family to graduate from college. She, like so many other students, worked meticulously to pursue her degree, graduate, and feels that she is doing better than her parents, both financially and professionally. But it all comes at a price: tens of thousands of dollars in student loan debt. The Hispanic population is one of the youngest and fastest-growing demographics in the United States. In 2016, a record number of 3.6 million Latinos were enrolled in postsecondary education, according to the Pew Research Center. As enrollments continue to rise, Latino students like Ana must also face decisions about how to cover the increasing cost of college. Financing postsecondary education can be daunting for most students and families — but Latinos must also balance the longstanding racial and ethnic inequities that affect them and other communities of color. They are more likely to live in poverty, have lower median incomes, and experience a widening wealth gap. Before the recession, white families had 3.6 times the wealth of Latino families and, in 2013, those numbers nearly doubled, according to the Federal Reserve System. To add insult to injury, state funding for higher education has declined, tuition has risen, and the federal Pell Grant — meant to help low-income college students — has not kept pace with rising costs. 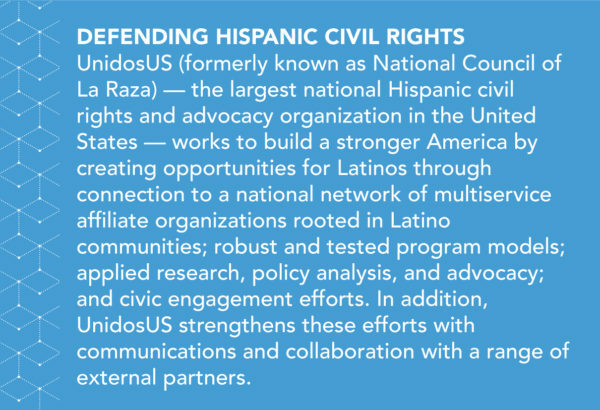 To learn more, the UNC Center for Community Capital (CCC), in partnership with UnidosUS (formerly the National Council for La Raza), interviewed Latinos across the United States about their experiences pursuing higher education including how they paid for school and student loan debt. CCC Research Associate Julia Barnard and Senior Project Manager Jess Dorrance interviewed 30 individuals from a range of educational institutions, some of whom used loans to pay for school. In 2015, 68 percent of all graduating students at public and non-profit colleges held loans, and the average amount of their debt was just over $30,000, according to The Institute for College Access and Success. Even more, student loan debt is now the second-largest source of consumer debt, just behind mortgage debt and exceeding both credit card debt and auto loan debt. In many ways, Latino individuals experience the same challenges as other students trying to finance their education in the United States. From difficulty completing the FAFSA, to unanswered questions about loan terms, cost, and repayment options, many interview participants lamented that they made huge financial decisions with lasting consequences when they were just kids. In other ways, though, some Latino students face additional, and sometimes unique, challenges. In the face of rising costs, they often work slightly more than white students — but they earn slightly less, according to data from the National Center for Education Statistics. After college, this group is more likely than others to struggle with repayment and experience default or delinquency. Additionally, completion rates among Hispanic students at both two-year and four-year institutions is consistently lower than white students. A majority of the participants in this research project, including Ana, were also first-generation college students. “When I was applying for college, four of my cousins were applying at the same time,” Ana explained. “We were all the firsts in our families to go to college. There wasn’t really anybody to talk to or to advise us about how to apply for college, how to pay for college, how to find the best fit. We were all just figuring it out together, which was good, but also really hard. Students who lack U.S. citizenship tend to struggle more than others. Nearly 75,000 have been granted a deferral from deportation through the Deferred Action for Childhood Arrivals (DACA) Program, which allows them to attend school and work in the United States with a valid permit. More than 26,000 are North Carolinians, according to U.S. Citizenship and Immigration Services. While DACA has removed some of the barriers to enrolling in higher education, many remain. Though some states provide in-state tuition for DACA recipients, many do not. DACA recipients are also ineligible for federal financial aid including grants and loans. DACA has allowed students to contribute more fully to society and to pursue opportunities previously denied to them. However, congressional action to protect DACA students and DREAMers is not guaranteed, as the Trump Administration’s plans for the program remain uncertain. A vast majority of Latinos — nearly 90 percent — believe a college education is extremely important. The economy of the future requires a workforce that has postsecondary credentials and, as the Latino population continues to grow, Latino students and workers will increasingly be relied upon to meet that demand. Affordable and accessible education would help boost the economy, with more Latino individuals buying homes, saving for retirement, or starting new businesses. Aside from the economic and social impacts of a more educated population, there is also a great deal of individual growth that can come from higher education. Many of the people interviewed as part of the study discussed how their worlds expanded as a result of college, and went on to describe a type of success and satisfaction they felt wouldn’t have been possible if they had not attended. 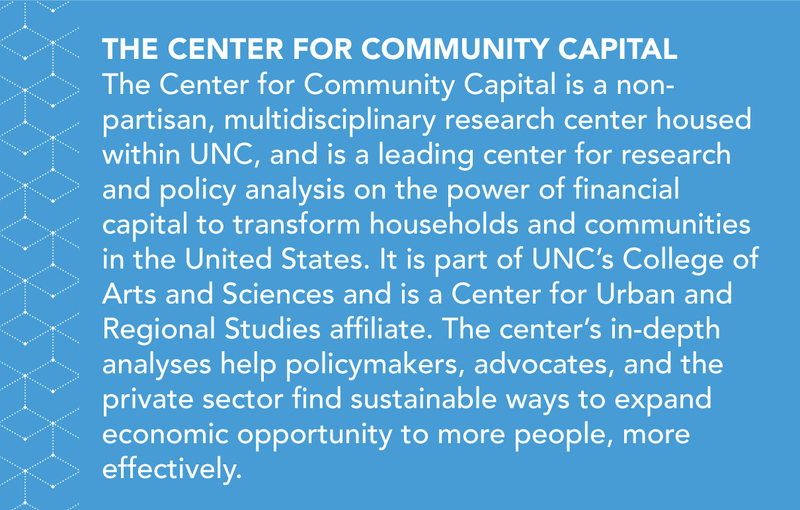 Julia Barnard is the research associate for the UNC Center for Community Capital. Jess Dorrance is the senior project manager for the UNC center for Community Capital. 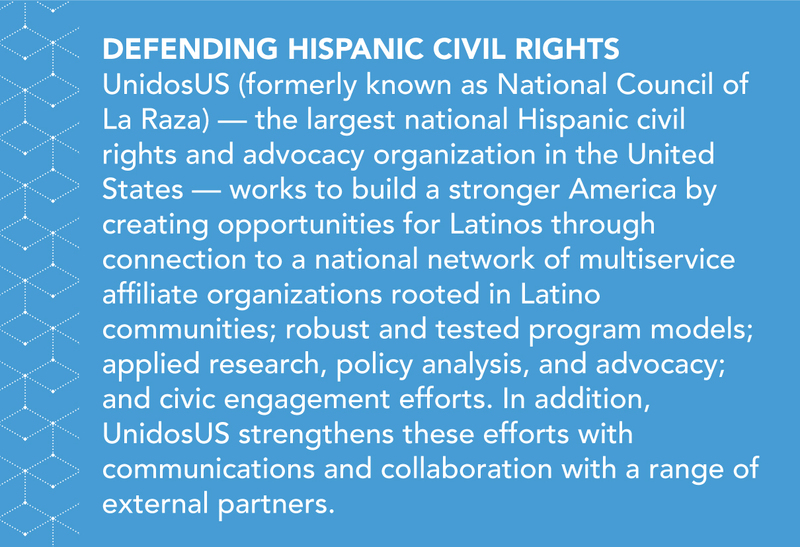 The UNC Center for Community Capital and UnidosUS are currently pursuing opportunities in order to study the impact of DACA on access to education. Additionally, the CCC, with support from the MetLife Foundation, is continuing their research on student loan debt by conducting interviews around the country. To learn more, or to get involved, visit communitycapital.unc.edu.